Nutmeg Spice is a flavorful coffee that features the warm sweetness of nutmeg, cinnamon, and other delicious spice-infused flavors. If you like to add a pinch of this and a dab of that from your spice cabinet when cooking, your will love the Nutmeg Spice flavored coffee. With an intoxicating and full-bodied aroma, this 100% authentic Arabica bean coffee will satisfy your senses, as well as your coffee cravings. Each cup only has 2 calories, so go ahead and let the delightful spices overtake your palate. In a heat-sealed valve bag, your coffee will be freshly roasted and full of Nutmeg Spice flavor. 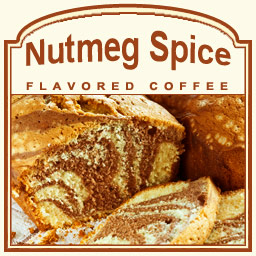 Roasted, packaged, and shipped on the same day, the Nutmeg Spice flavored coffee will be a uniquely seasoned, coffee creation full of autumnal flavors perfect for any time of day or year as a spicy pick-me-up!